Here's a Shabby Chic Stationary Set I added to the shop. The teddy bear is so cute and the whole set is a marvelous gift. 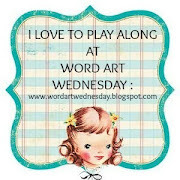 Thank you so much for posting you creative and very lovely art in the #234-#235 - Anything Goes Word Art Wednesday Challenge. Oh that teddy is just the cutest, pretty background papers too!